Blanche: Why don�t you kiss me goodnight? John: I�m not facing that way. 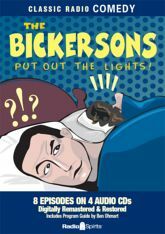 Created and written by Philip Rapp, Mr. and Mrs. Bickerson were the first married couple on radio to have a truly adversarial relationship. Scathing, sarcastic and comical, John and Blanche would fight about anything. Although they often argued about Blanche�s good-for-nothing brother, she would certainly insist that the big troubles were caused by John�s snoring and her resulting insomnia. There was nothing sweet or tender about their pillow talk, but it sure was funny!